Known as the nation’s leading maritime museum, the Mystic Seaport museum in Mystic, Connecticut, welcomes 284,000 visitors per year. Visitors to the museum can see a working shipyard, formal exhibit halls, and a recreated New England coastal village. Of the 500 historic watercraft on display at the museum, four are designated as National Historic Landmark vessels. Among these famed four, the Charles W. Morgan continues to be a point of pride for the institution. While the Mystic Seaport Museum was founded in 1929, the area it now occupies had been a hub for ship building and related commerce since the 1600s. However, the advent of steam power and the introduction of industrialization brought a decline to the maritime industry, replacing it with textile manufacturing. Despite this, Carl. C Cutler, Dr. Charles K. Stillman, and Edward E. Bradley came together to create the Mystic River Seaport Museum, an institution that would preserve Mystic River’s maritime past while inspiring future generations of seafarers. During the Depression, the museum received many of its initial donations, and photographs, ship plans, and a myriad of other maritime artifacts poured into the institution. By 1941 the museum ha acquired the famed Charles W. Morgan, and several buildings were being brought to the museum to complement it, creating the maritime village visitors see today. The Henry B. DuPont Preservation Shipyard along with new exhibition buildings were added in the 1970s. As the museum’s holdings grew, so did the educational programming it provided to academicians and the public alike. Today the Mystic Seaport Museum is considered a premier research institution holding the world’s largest collection of maritime photography and boats. Sailing the globe from 1841 to 1921, the Charles W. Morgan is considered one of the oldest commercial ships afloat today. During its 80-year career on the high seas, this remarkable ship undertook 37 voyages, weathering numerous hardships like Arctic ice, storms, and even the famed hurricane of 1938. 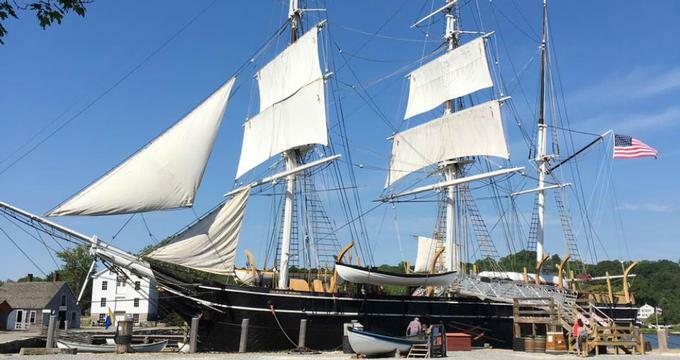 Prior to arriving at Mystic Museum, the Charles W. Morgan was displayed at Colonel Edward H. R. Green’s estate in South Dartmouth, Massachusetts. In 1966 the vessel was designated as a National Historic Landmark and won the World Ship Trust Award. After extensive restoration work, it was re-launched in 2013. Its 38th voyage began in 2014 and included visits to many historic ports of New England. Today visitors are allowed to tour the vessel, which is now moored at Chubb’s Wharf in the museum. History buffs with doubtlessly relish weaving in and out of the authentic 19th century buildings that comprise the Seaport Village at the Mystic Museum. Staffed by craftspeople, storytellers, historians, and even musicians, the site allows visitors to have an immersive, educational, and entertaining experience. The Henry B. DuPont preservation shipyard is the only one of its kind in the nation. Skilled tradespeople employed at the shipyard use historically accurate restoration methods in their work, allowing visitors to see traditional methods that were used in the founding days of New England. Driven to near extinction by the introduction of steel and fiberglass, many of the skills used at the shipyard are rarely seen elsewhere. Visitors can get a birds-eye view of the workers from the visitors’ gallery, which allows them to see a rigging loft, carpenters’ shop, and an 85-foot spar lathe. The Sabino, the Emma C. Berry, the Dunton, and the Charles W. Morgan comprise the museum’s collection of National Historic Landmark vessels. These remarkable award winners are just four of the over 500 vessels that visitors can tour at the Mystic Museum. In addition to taking tours of the watercraft on display, visitors can obtain hands-on sailing experience, participate in the famous Dead Horse ceremony, and cruise Mystic River. Designed by Armand Spitz in 1960, the Treworgy Planetarium offers visitors information on how knowledge of the night sky enabled the earliest sea voyages. Visitors can learn to identify key constellations by participating in the planetarium’s educational programs and guides. Visitors can find 12 formal gardens and 40 container gardens scattered across the museum’s 19 acres of land. Two of the formal gardens at the museum are historical 19th century gardens. The Buckingham-Hall garden and the Burrows House garden show museumgoers heirloom varieties of edible and decorative plants that were key to the economic, cultural, and medicinal traditions of the Industrial Age in New England.